Do you remember the Kawaii Box Unboxing that I did a little while ago? Well I am back with another unboxing of Kawaii goodies from the company behind the Kawaii Box...Blippo. To enter the giveaway please use the widget below! Some people were asking in the 'Mrs Brimbles Happy Place' Facebook group about where to buy inserts for their Fauxdori. 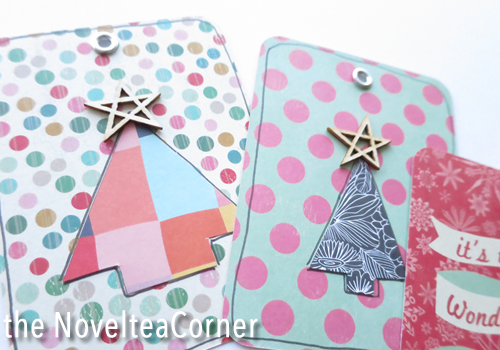 They are super quick and easy to make and the beauty of making your own is that you can use whatever types of paper takes your fancy! So here by requested is my little tutorial for you! Hope you enjoy and I can't wait to see all your inserts. I realised that I have been neglecting my blog for a little lately and I haven't posted many photos of late. 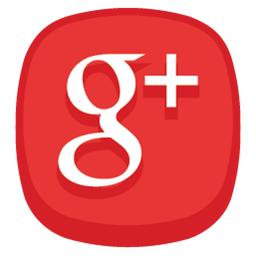 My lovely Design Team have been keeping the blog active which I am really grateful for. I have no excuses, I have just haven't blogged lol! 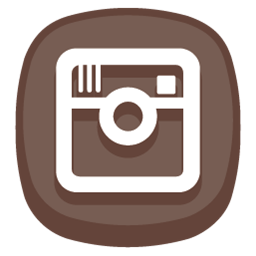 I've been around on other platforms mainly instagram and Facebook and of course YouTube. For a vast proportion of last year I was doing a weekly planner page decoration post which I realise I have not posted for ages so I thought I would do a bit of a show of my pages from this year so far. Since I divided out my planners last year I have been really into page decoration big time this year and I can see myself continuing on this for the foreseeable future. So if you have missed my posts elsewhere, here is how this year has looked so far. 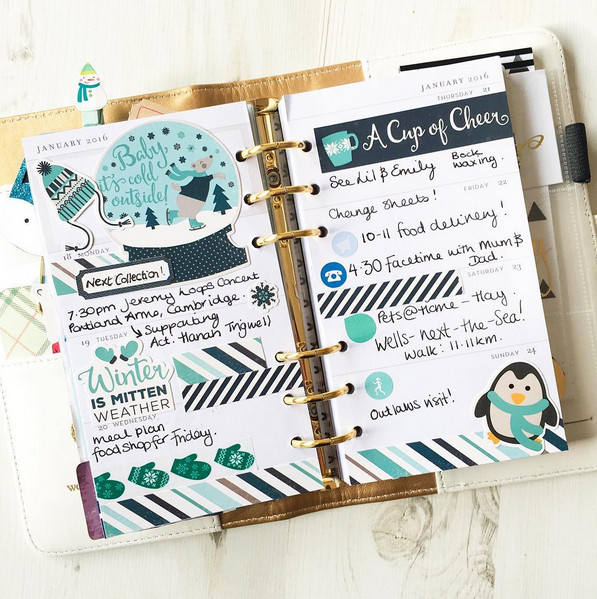 I have consistently been in my White Websters Pages Color Crush planner although I have a feeling this may change in February! The lovely Chris from Scrawlr Box sent me a January Box to review / share with you guys. 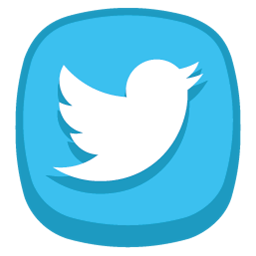 What is a Scrawlr Box? ScrawlrBox provides subscribers with a monthly box of mystery art supplies. Inspiring artists of all abilities each month, with a new selection of creative tools. So what was in the box?? 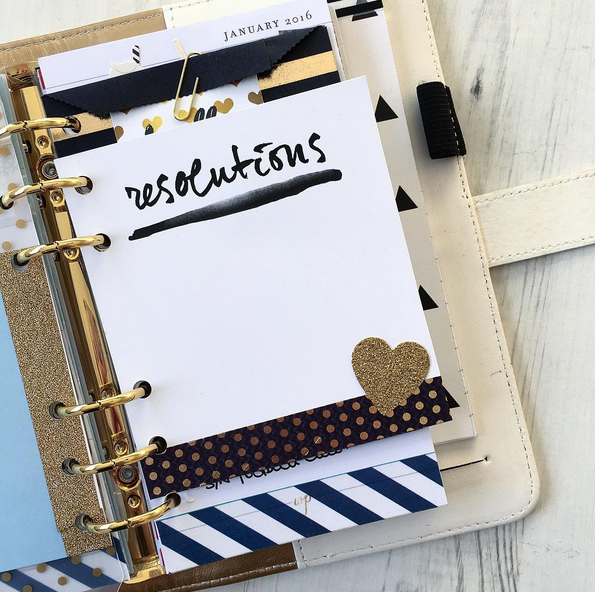 Hello everyone, it's Zinia here joining you once again to share how I used my January Brimbles Box to make my planner sparkle. 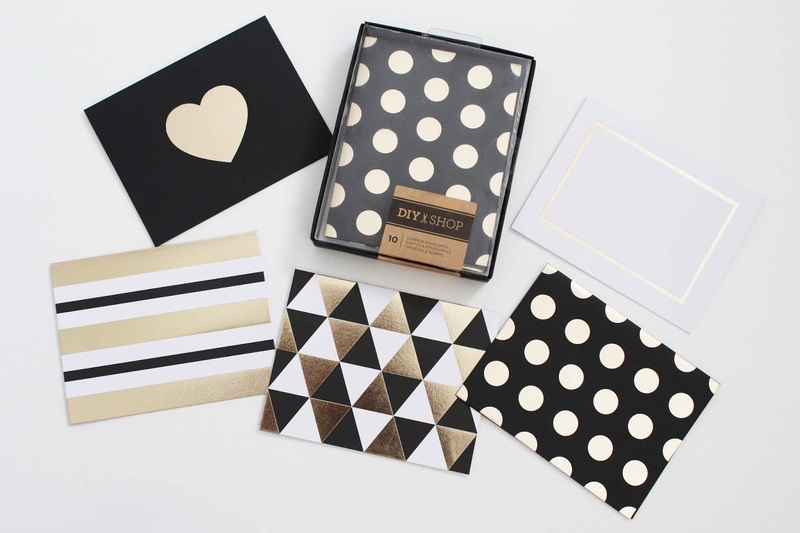 I'm sure you already know that January boxes were so freaking gorgeous. That black, white and gold combination is so perfect and totally classy. For this month I received the A5 planner box and I'm so happy I chose that because this color palette looks magical in my lilac kikki.K. I really wanted to bring some of the black in my planner so I used one of the gold foiled paper bags and added it inside on of the pockets. I was very excited to find out that the size fit perfectly! Since it was a bit tall, I secured it on it's place with some gold bow paperclips. I find it extremely adorable how the tiny bow clip that was included in the box looks like the child of the Kate Spade clip. I'm in love with the simplicity of the dashboard this month but I felt it needed a tiny bit of spark to balance all the gold that I have in my pockets so I took a little piece of the glitter washi tape and cut a banner to add on it. It's such a small detail but I felt it brings everything together. On the back side of my dashboard I decided to stick another one of the paper bags to hold some of my favorite goodies to use in the planner. I just used some repositionable adhesive just so I can remove it later if I want to without ripping the bag or the dashboard. Inside the bag I tucked the Heidi Swapp notes and some extra tiny bow paper clips. During my office tour the other day I said I would probably do a seperate video and show you my Fauxdori collection as I haven't really shown them except the odd glimpse on instagram and that. PLEASE NOTE: This review is my own personal opionion on the product / company, given in good faith and has not be sponsored or endorsed. None of the links are affiliate links. Get to know the Happy Mail Box! Its the Brimbles Happy Mail Box in the house!!! This month I opted to get the happy mail box. I typically get the planner boxes but I do love getting an occassional different box. She has so many! 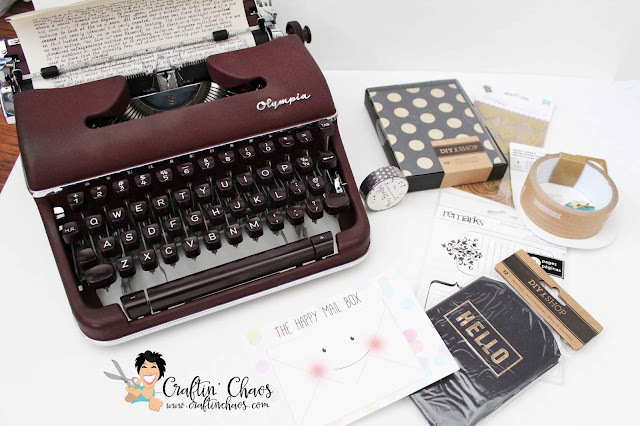 Happy Mail, Stationary box, personal and A5 planner boxes. During the holidays she had an Advent box that was so awesome. The box was filled with 25 little presents to unwrap each day until Christmas. Here is a little run down of what kind of items you can find in each box. More details are listed in the "shop" section of Mrs. Brimbles site. 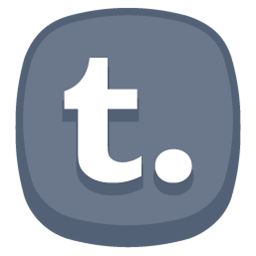 Click here to be taken there. The stationery box is a box full of stationery and crafty items for the creative planner or if you like to journal, project life etc. Full of a mix of washi tape, die cuts, ephemera etc. Planner boxes you can select A5 or personal and it has washi tape, pens, project life cards, stickers etc. It is something different each month. Anna always has her own art in the box on the dashboards or even stickers and notepads. Happy Mail box is for pen-palling. You will find cards, pens, journalling stickers, regular stickers, washi tape and more. Again each box will have a variety of items in it. Here is a pick of what came in my January Happy Mail box. 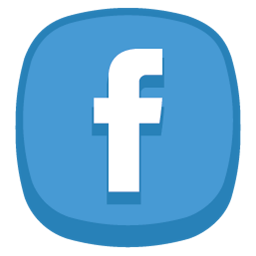 If you are looking for penpals there are lots of great facebook groups for pen-pals and also if you haven't checked it out pocket letters are the new craze. 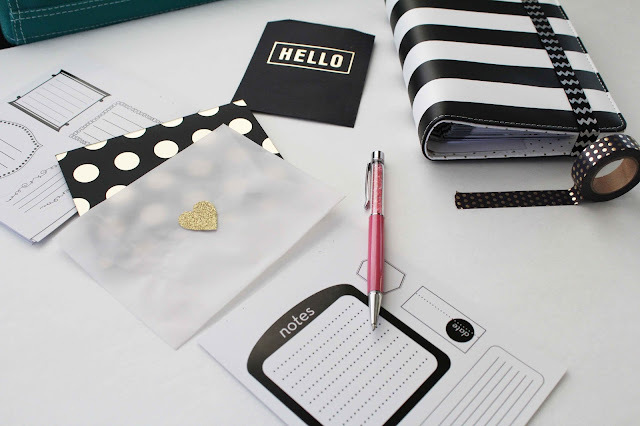 Its another fun way to send a little note and some goodies to your penpal. I hope you enjoyed this little peek into a different Brimbles box than I normally get. 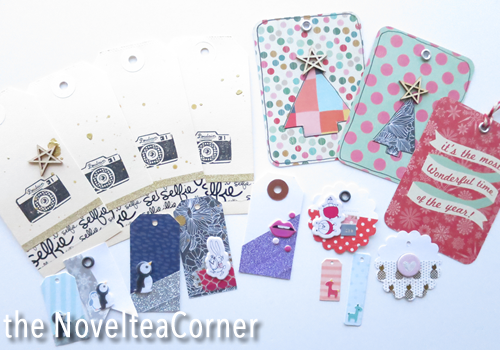 I love seeing all the different themes each month and all the different goodies Anna has gathered for the box. She does do an awesome job of making it unique. My office / art / craft room tour! You guys keep on asking to see an office tour and where I keep my stuff so here it is! If you want to see what it looked like back in August 2013 when I first moved in and first decorated you can see that video below. As you can see it has changed somewhat since then! Every Brimbles box I've had has been a springboard of inspiration. I've struggled, in the past, to get creative with Christmas stuff that's usually on the market. The last box changed that for me. Then when I received this box in December I was really taken back that Mrs B did it again with putting together something really special with a Christmas theme. Special because in such a short space of time she created her own art work and made them into ephemera. There was so much in this box that I've put some aside for next Christmas. So this dashboard was my first in A5 size. 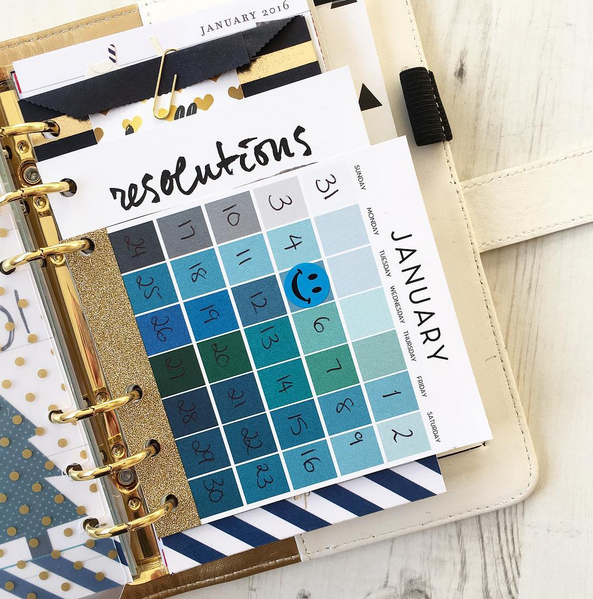 I treated myself to the A5 platinum Crape Diem planner, and it arrived just in time to set up for 2016. It's so nice to have the option of mixing things up and putting a new dashboard in every month. Especially when they are unique prints of Anna's art work. I also attached the snowflake planner charm. 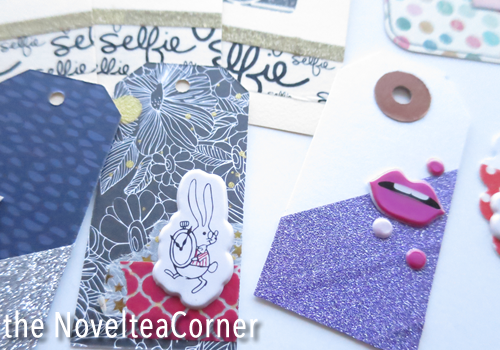 Next, I decided to use the ephemera and project life cards in my journaling. First I used Anna's ephemera in my Bando planner. They look so cute in there! With 2016 now here, I have begun some new journaling projects. I've had to prioritize between my different journals which means my Bando has been put aside, for now. One project is using mixed media in my journaling. I have a small Dylusions Creative Journal which I'm using for this project. The ephemera and project life cards worked really for this. Here is the process video for the above journal page. So, grab yourself a cuppa, relax, and enjoy! I thought it might be fun to do a flip through of all of my inserts from 2015 so you can see my style and how they were decorated! Hey, everyone! It's Charlie from seasaltandpaper.com. Happy New Year! 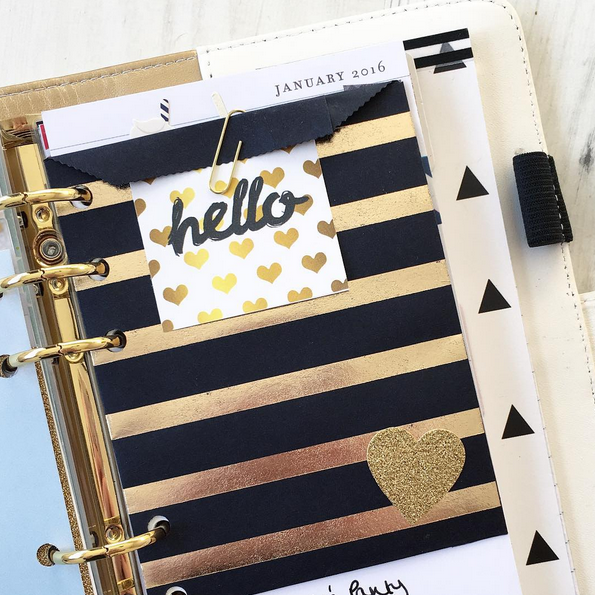 I'm back on the Mrs Brimbles blog to share with you how I've been using my January 2016 stationery Brimbles Box. This month's theme is all about seeing the New Year in with a bit of glitz and glamour, something to help you shine and sparkle your way through the first months of the year. You can check out what products I received here in my unboxing post. Setting up my planner for 2016 I knew I needed to jazz up my dashboard. As it's the first thing I see when I open up my planner I like to change it up now & again depending on my mood. After some umming and erring, I decided on making my own 'Project Life' cards using some scrapbook paper. I didn't want to cut the larger size Project Life cards which came with my January box because they are just so beautiful! (The 4x6 Project Life cards would be perfect to use on an A5 planner dashboard.) I rounded the corners with a punch and added some of the Pink Paislee stickers to finish them off. 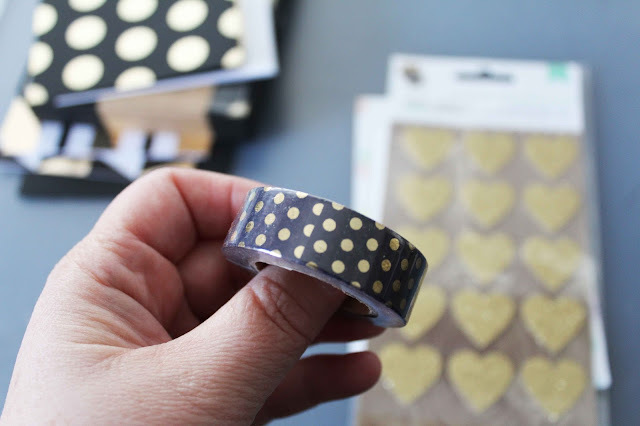 I was super happy to find some gold glitter washi tape in my Brimbles Box - I'm sort of obsessed with pink and gold at the moment! 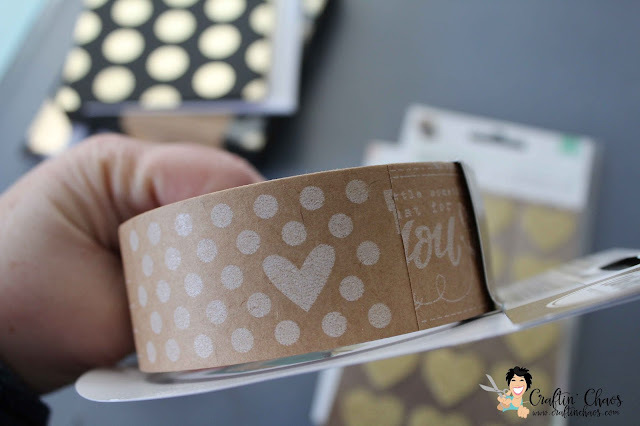 You can attach Project Life cards to your dashboard with glue dots, however, I like to use washi tape to brighten it up, plus it's easy to peel off when I feel like changing the card. 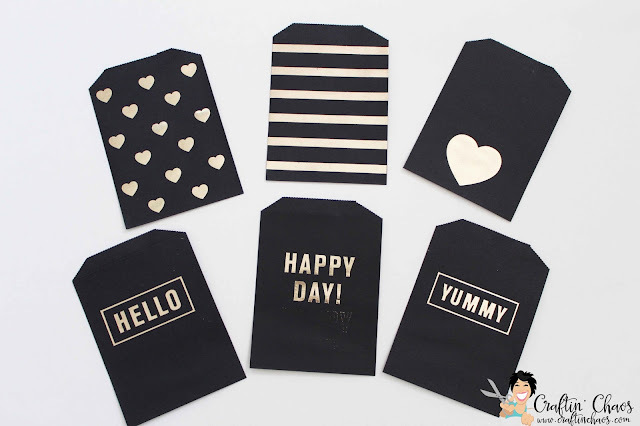 I received four mini Heidi Swapp notepads - aren't they just stunning!? They came with little sticky pads on the back so I decided to stick them to a clear plastic Filofax flyleaf so I can have them at hand in my planner. The sweet little treat bag I punched and added to my planner - using it as a pocket to keep some Project Life cards in. It's just perfect for storing all sorts of things - stickers, ephemera, stamps... Lastly, I added a cute bow tie paper clip to my dashboard. It's holding my master to-do list behind. I like that they are mini sized and don't add a lot of bulk to my planner. To be honest, I LOVE every single thing in the January Brimbles Box. There's not a single item that's not to my taste and there are so many possibilities. Here I've shown you some basics but what I have left over I will be getting creative with. How will you be using your January goodies? I am using the January 'These are the days' journal cards in my planner this month. I loved using them last year and I kind of tailed off in the later months of the year but I felt like using them again. I am using the month card to track any fitness I do and I reward myself with a little smiley sticker every time I do something! I keep my little stickers in a pocket bag which I hole punched and added in. 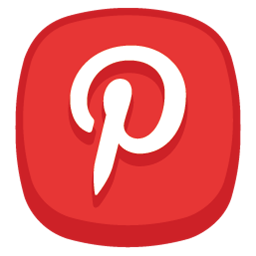 It works really well as not only does it look pretty but it also means they are really handy and easily accessible! I am also using the little 'resolutions' card to remind myself what I want to do. Here is it before I add mine to it. Not because it is secret or anything but because it looks nicer without my handwriting on! I did embellish it a little with washi tape and a sticker because, well, it was fun ha ha! Since I got this new Fauxdori (from Lyra & Co) for Christmas, all I've wanted to do is use it to journal in! It is the perfect 'winter' themed fauxdori, without being too classically wintery. Before this I was using my Christmas one, so it's nice to change things up a bit! I decided to again, use things from my December Stationery Brimbles Box to decorate my journaling pages. I was breaking the ice in this insert, which I always find the most difficult. So I chose to print off some snowy photos from a few years ago and journal about them. Instead of journaling about the current day, or something that went on recently, I find this the easiest way to start in a new insert. I'm not 100% sure why, but I do it a lot when I get in a rut. I think my thought process is, if I want to journal then I should take advantage of that motivation, and journal about something from ages ago, because it's better than journaling about nothing! The snowflake bookmark was in my December Brimbles Box, and it goes with this fauxdori absolutely perfectly! The tassel looks so pretty popping out the top. I decided to kinda of 'Smash Book' some of the little bits of packaging from the box. Like the blue tissue paper I used to split the pages up (though for some reason this made it harder to journal on, my Coleto pens just did not like the tissue paper haha). I also kept the little penguin sticker (in the top left corner), because it was too cute not to. I used the Silver Snowflake washi from the Brimble Box, along with some silver glitter tape from Paperchase, and I also cut some of the Ellie Beth Designs UK snowflake stickers in half & stuck half at the top of the page. I went through the stickers from my Brimbles Box and picked out some of the glitter trees and penguins to add to the page. I added two dates at the top of the page, one was the date I did this journaling, the second was the date the photos were taken, and the day I was journaling about. I'm glad I did this, because when I'm looking back through my journals, the date is the first thing I look for on a page. I used one of the Winter Journaling Cards from the set I received in my Brimbles Box, and made it into a little flap. I did this because I had three photos I wanted to add to the pages, but I didn't want to have to cut down on any journaling or decorating. Plus having little hidden bits in a journaling spread is always fun to look back on! 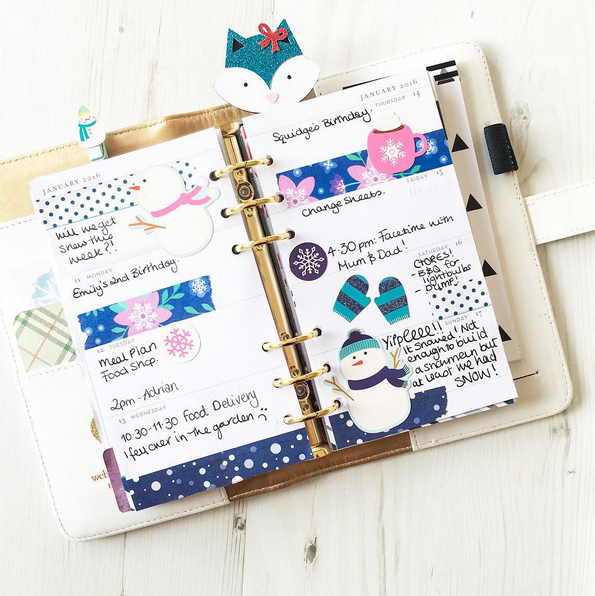 I used the other half of the Ellie Beth Designs UK snowflake sticker at the bottom of this page. I added some red and white paper tape from Paperchase to break up the straight edges of the photos, and I also cut some corners out of a journaling card, so I could add them to the photos to make them look like photo corners. I wanted to add one of the absolutely adorable die cuts that Anna has designed to the pages somewhere, and I couldn't quite work out where to put it. I eventually decided it would fit really nicely at the top of the journaling card flap. It fit really well with the trees and didn't cover up too many things on the page. I chose to staple this on, just to make it a bit different. There was a little bit of blank space I thought needed to be filled too so I added some B&W heart washi tape from Cloudy Cow poking out from underneath. I didn't want anything too eye catching, I just needed something to break up that area a little. I added some more little corners to the photo and some more of the red and white striped tape. I used some alphabet stickers I got from Hobbycraft, to add the word 'REMINISCE' at the bottom. (can you tell I ran out of N's?! So I had to change an 'M' into one!!). 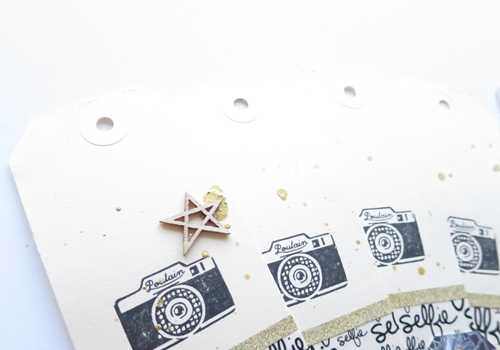 The little 'Awesome' die cut was from a die cut set by Carpe Diem (Also available on Anna's shop here). 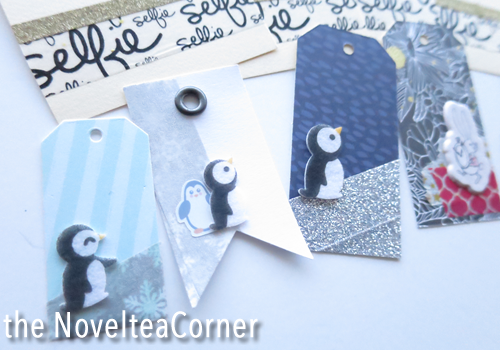 Then the cup, snowflake, and penguin stickers were all from my December Brimbles Box! At the moment I'm really in a journaling faze, specifically in my fauxdori (can you blame me... This fauxdori is beautiful!). I've loved using things from my Brimbles Boxes to decorate my pages, and I can't wait to start filling up this insert even more. Now I've broken the ice there'll be no stopping me! I feel like I can use so many different supplies in here, and it never looks 'messy', I've got stamps, stickers, washi tape, alphabets, photos, die cuts, tissue paper, and journaling cards! All in the space of two pages. Journaling gives you the freedom to use and do whatever the heck you want, and I think that's what I love about it! 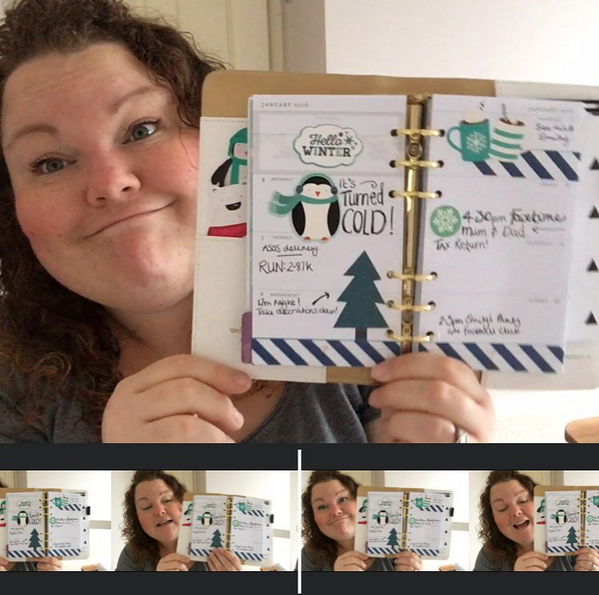 In this video I thought I would talk about which planners and journals I will be using in 2016, the 'line up' as it were! 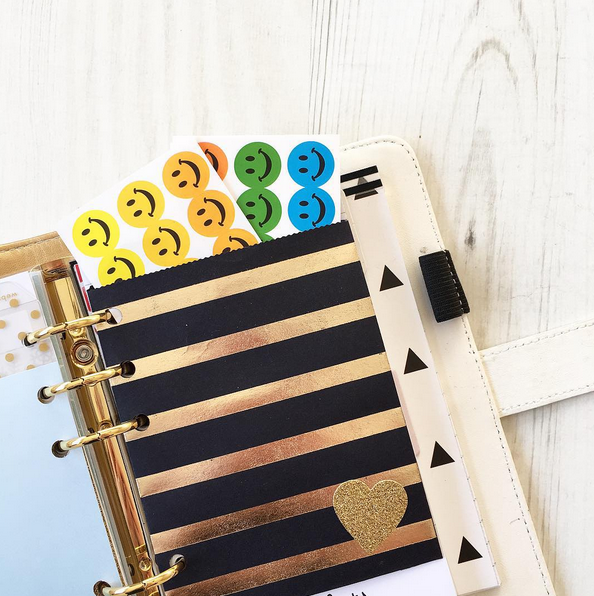 For some it may be too many, for me it just right, my happy mix of 'workhorse planner' and 'creative planner' as well as my creative need to create in whatever notebook / sketchbook / journal takes my fancy at the time. I hope you enjoy this peak into the inner workings of my mind and life. It's a long one so grab a cuppa before you sit down! I also talk briefly about my word for this year and how I chose it and what it means to me. 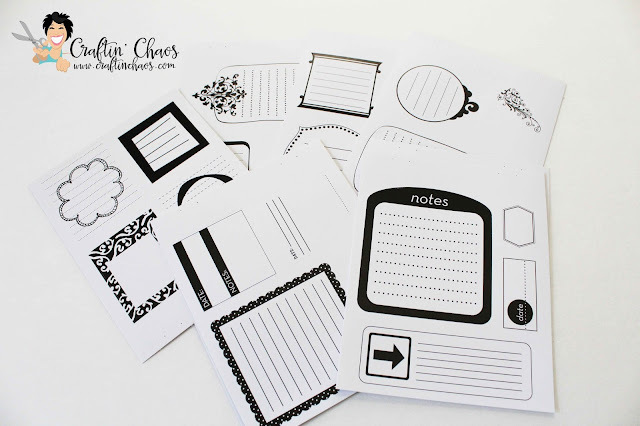 This month I'm back on the Mrs. Brimble's blog to share another way that you can use your paper crafting goodies that come in your Brimbles Boxes. 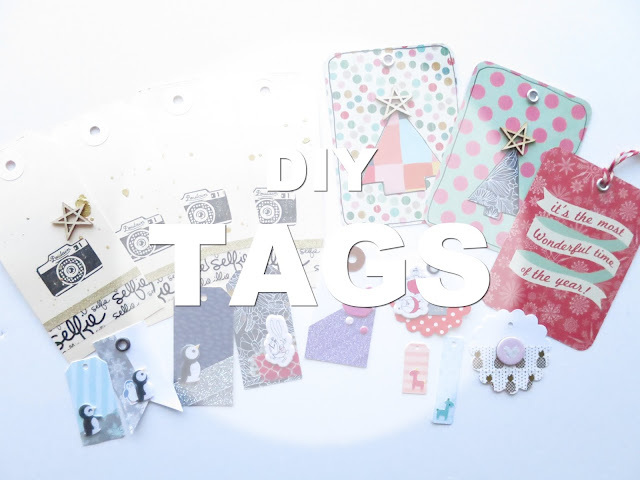 For this activity, you simply need to pull out your favourite papers, stickers, ephemera and anything else you've been holding on to. We collect these fabulous creative resources, and today we're going to use them! My big tip is don't let your crafting goodies sit there. Use them! That's their purpose. Mix and match, use interesting shapes and colours and be creative! 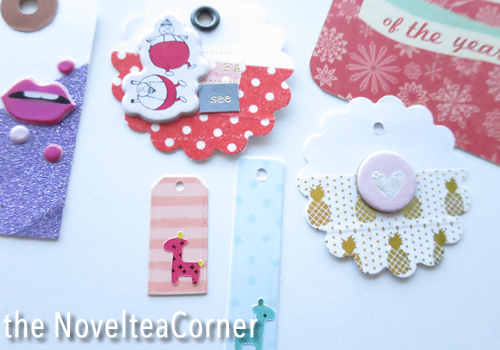 For more ideas, tips and DIYs, stop by my blog the Noveltea Corner or check out my YouTube channel. Until next time, friends, happy crafting! Happy Mail Box, Christmas Journaling!